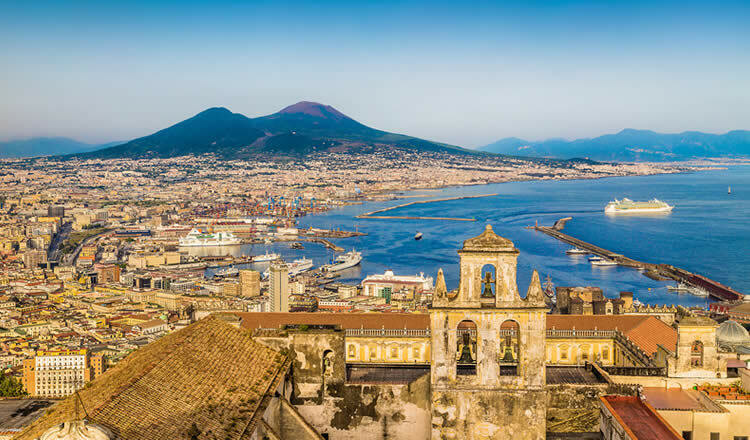 Naples or Napoli lies on the west coast of southern Italy between the hill of Posillipo and the slopes of Vesuvius, Europe’s second largest active volcano. It’s the third largest city and capital of Campagniain Italy. Naples is a vibrant and lively city, world famous for its blue bay. Ships dock at Molo Beverello in downtown Naples at Stazione Marittima, located next to the marina beside the ferry terminal from where you can take a ferry to the pituresque island of Capri. Plenty of hotels can be found within close distance of the cruise ship terminal. The seaport of Naples is the second most important in Italy after Genoa and one of the largest passenger ports. Near the harbour at Piazza Municipio, across from the cruise terminal, is Castel Nuovo, an impressive castle from the 13th century and one of the symbols of Naples. The oldest castle in Naples is Castel dell’Ovo, a seaside castle perched in the Bay of Naples. Cruise ships dock right next to the marina which is beside the ferry terminal from where you can take a ferry to the pituresque island of Capri with its first class hotels and restaurants. The terminal is located at Molo Beverello in Naples city centre at Stazione Marittima. We can offer you great availability for accommodation. Stay in a cheap or more luxurious 4 or 5 star hotel, a cosy b&b or in a city centre apartment. All lodging is located within close distance of the Port of Naples, cruise pier and ferry terminals. Major cruise lines departing from the port include MSC Cruises, Costa Cruises and Royal Caribbean RCL. Popular 4 star hotel with beautiful sea views located close to the beach, port and marina. Ideal for ferries and cruises. 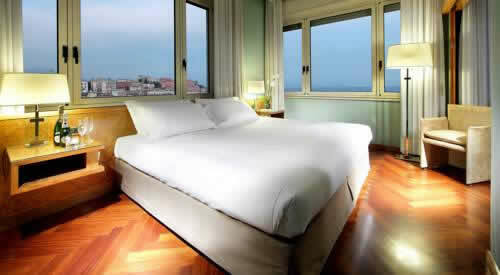 Situated in Naples Italy city centre, right in the heart of the Chiaia shopping district. Not far from port and harbour. 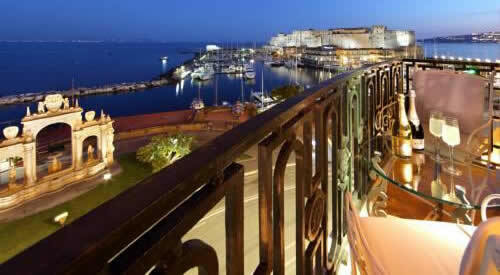 Four star property located on the seafront promenade offering views across the Bay of Naples and Castel dell’Ovo. Stroll along Naples’ narrow winding streets and admire all amazing sights of this city. Start your day at Piazza Plebiscito, the most beautiful square in Naples surrounded by the Royal Palace and the church of San Francesco di Paola. Visit the Museo Archeologico Nazionale or National Archeological Museum, displaying thousands of artefacts. Many of the objects come from excavations at Pompeii. Teatro di San Carlo is the oldest active opera theatre in Europe. The surrounding area offers a wealth of historical monuments. Don’t miss a visit to the ancient UNESCO World Heritage-listed city of Pompeii with its fascinating sights such as the Forum, the Lupanar and the Thermal Baths. Nearby is Herculaneum, a breathtaking archaeological site which was also destroyed during the eruption of Mt. Vesuvius. Take a trip to this legendary volcano and hike to its summit and peer into the crater. Mt Vesuvius is the only active volcano in continental Europe. Amalfi Coast — popular by cruise passengers is a full day tour to the Amalfi Coast and the charming town of Sorrento, from where you will have splended views of the Bay of Naples and the Mediterranean Sea. The Amalfi Coast or Costiera Amalfitana is one of the most beautiful stretches of coastline in Italy. Follow the Amalfi Drive and stop in the town centre of Positano, where colourful hotels, boutiques and lemon-themed ceramics shops surrounds the parish church of Santa Maria Assunta. Nearby is Amalfi with its wonderful views and where white houses cling onto the rocks opposite the Saint Andrew Cathedral. The charming resort of Ravello is nestled above the fascinating landscape. The Villa Rufolo, from the XII century, built by the Rufolo’s family and Villa Cimbrone, are two sites not to be missed. See also : Civitavecchia Port and Hotels, Savona Italy, Trieste Port, Brindisi Cruise and Ferry.